Assos is my favourite village on Kefalonia. 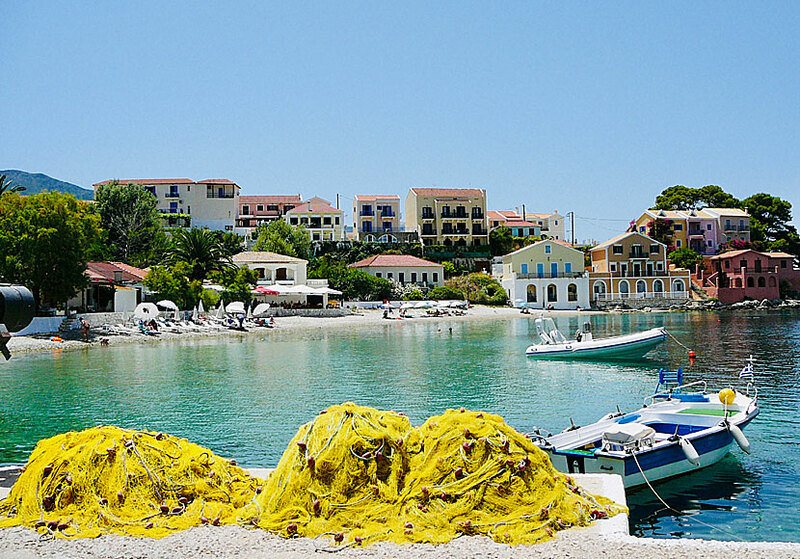 The village is extremely photogenic set on a small peninsula about 40 kilometres north of Argostoli. Few villages that I know about is so scenically beautiful as Assos, it almost look like a backdrop. The village begins at a steep slope and continues to a narrow strip of land that connects a peninsula. 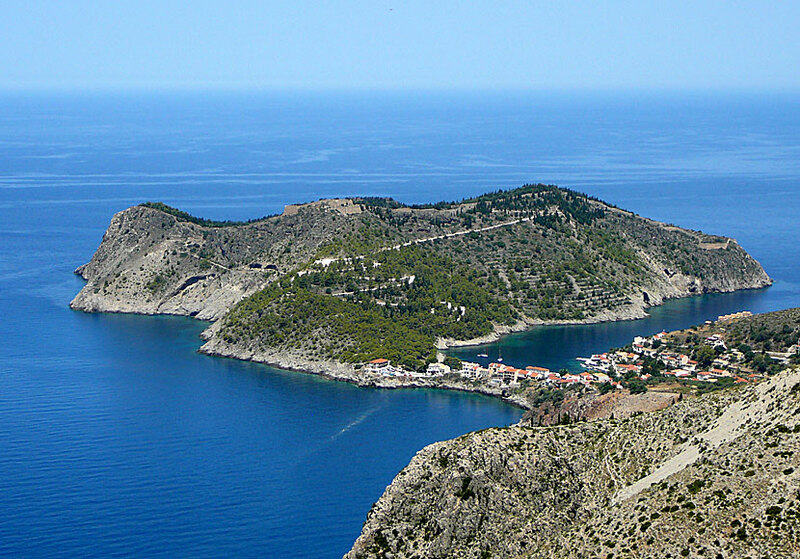 The beautiful view of Assos and the peninsula where the castle is located. On the peninsula outside Assos lies a so-called Kastro (castle), built in the late 16th century as protection against the Turks and pirates. The Kastro had its heyday until 1685, when there were about 260 houses inside the 2 kilometres long wall. The Kastro lost its importance after 1685 and began to disrepair. The Kastro was used as a prison in the 1930s, it was closed after the earthquake. There is not much to see inside the Kastro, but the view of Assos is pretty. To the right of the parking lot, where the road ends, is a small pebble beach. A longer, and much better, pebbly beach lies in the village which is located to the right of the parking lot. The water is clear and seductive enticing.
. The welcoming waterfront is lined with cosy tavernas and cafes, many of them are hard to resist. Here you can linger away a lot of time over a beer or a frappe (iced coffee) and look out over the picturesque harbour bay. South of Assos is the famous beach of Myrtos. Assos managed to escape the worst of the earthquake in 1953, some of the old houses in Venetian style remains. Unfortunately, some new houses whose architecture does not fit into the old environment have been built in recent years. But it is like that in many places in Greece where tourism is increasing. On the hill in the background are several good hotels and pensions. If you like peace and quiet, to read books in a beautiful surrounding, and to be close to a beach, then Assos is a perfect choice. Here are some really nice hotels, as Linardos Apartments.